Digital technologies have added a new element of anxiety to family life for many parents. A lot of kids now have access to mobile devices, which brings up parent concerns that kids aren't learning to interact with people, spend too much time on devices and no longer play outside. Often parents are most concerned about their young children spending time on devices because they know the early years are a crucial time for a child's brain development. But at the same time, parents are often just as addicted to technology as their children, constantly checking phones for news, work and fun. 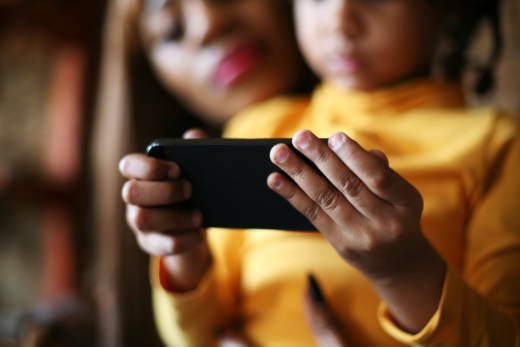 The discussion around the best way to handle mobile devices is a good one to continue, but Sara DeWitt of PBS Kids Digital says some of parents' deepest fears could be holding them back from seeing the potential of digital technology. Fear #1: Screens are passive. While some activities on devices are passive, not all are. DeWitt describes games she tested that had kids pretending to be the animals they saw on the screen. And, when adults shut off the device kids continued pretending to be animals. Even better, they remembered many of the facts they'd learned in the game as they were flapping their arms. "The digital technology prompted embodied learning that kids can now take out into the world," DeWitt said. And moving while they learned helped kids remember the science facts about the animal they imitated. Fear #2: Digital games waste time that kids should be using to learn. Again, there are digital products that don't offer much learning potential, but increasingly researchers are interested in the data behind game play. A group of UCLA researchers wanted to know if the back-end data from a Curious George math game produced by WGBH could predict preschoolers' scores on a standardized test. They found that even though the game was not built to assess math, the choices a player makes while playing says a lot about cognition. The researchers could predict how different kids would perform on the standardized math test by analyzing how they played the game. DeWitt wonders if advances in this field could reduce in-class standardized testing. Could they give a more nuanced picture of a child's cognition and areas of growth that teachers could use to direct learning? Fear #3: Screens isolate. Research around digital media and parenting shows that kids learn a lot when their parents interact with them about the digital media they are consuming. The back and forth conversations that have always been a bedrock of child development still hold true, but digital technologies can add content to those conversations. And kids "love to play with their parents," DeWitt says. They don't want to compete with a device for their parents' time. "Kids are living in the same world we do, the world where grown-ups check their phones 50 times a day," DeWitt said. Rather than being scared that all digital devices are bad for children, she encourages parents to raise their expectations of media, consume products responsibly, and to look for the positive qualities of technology, which has undoubtedly changed how people interact with one another already. Check out DeWitt's TED talk to learn more.